I was able to rent a car for today and tomorrow, so I could cover a little more ground. 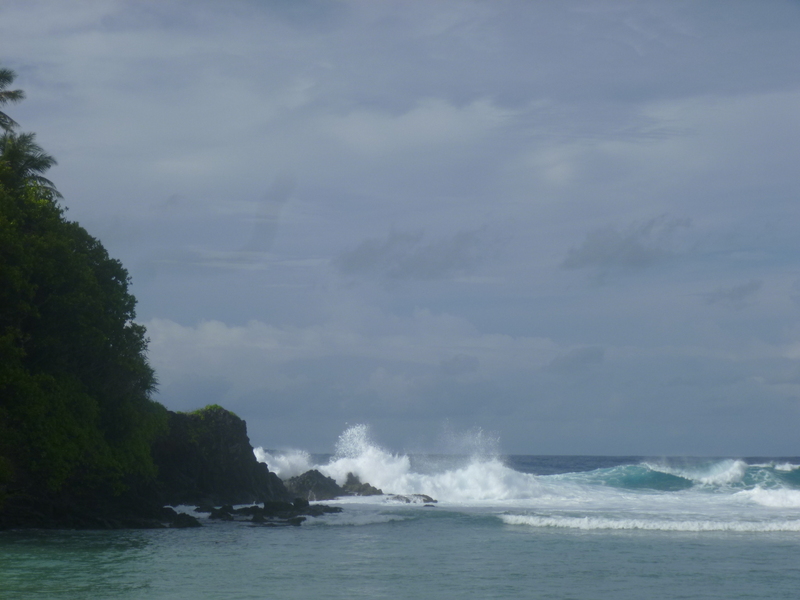 My goal today was to explore the less crowded east side of the island, and then cover the west side of the island tomorrow. 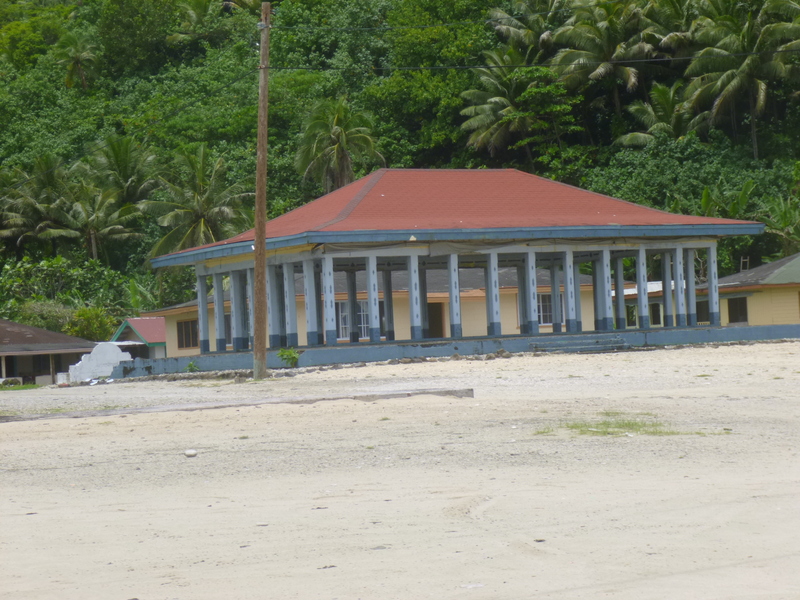 Today was Sunday, and the people of Samoa are very religious, and nearly all businesses are closed for the day, and the buses do not run. So I packed up a sandwich, bananas, carrots, water and even brought along the ice bucket from the motel to help keep things cool. And I set off with the intention of pulling over whenever I found a good walking place. 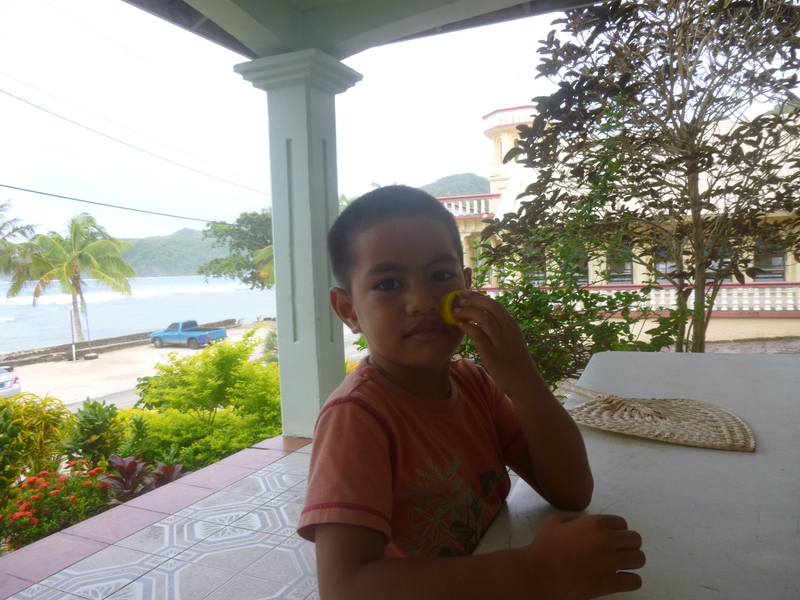 The center of the island, where I’m staying, is usually quite busy, especially with the port here. 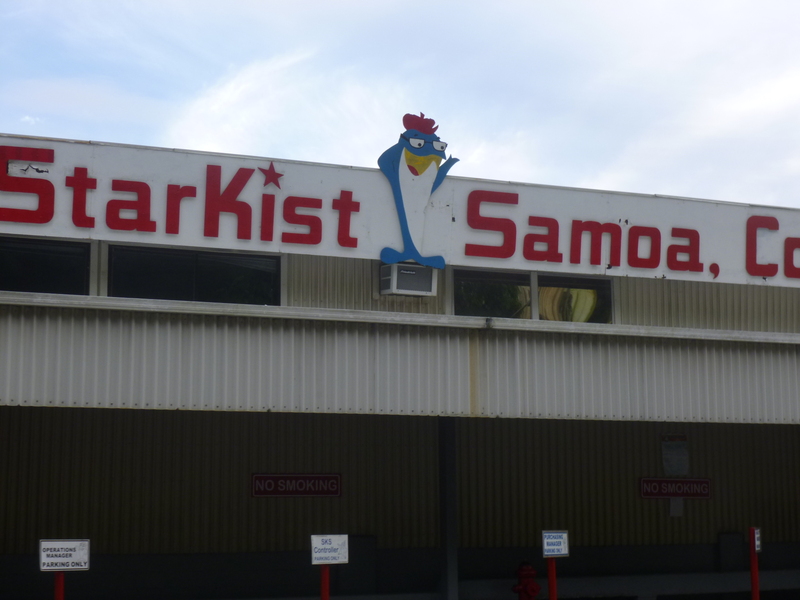 It took a bit of time to drive past the area I’d already walked around, and then I came to a huuuuge Starkist tuna factory. It wasn’t running today, but it’s a very long building right along the water, and looks very industrial and would not be an area I would feel comfortable walking by. Later I found out that the tuna factory and the government are the 2 biggest employers in the island. Once I got past the tuna factory, I was utterly charmed for the whole rest of the day. 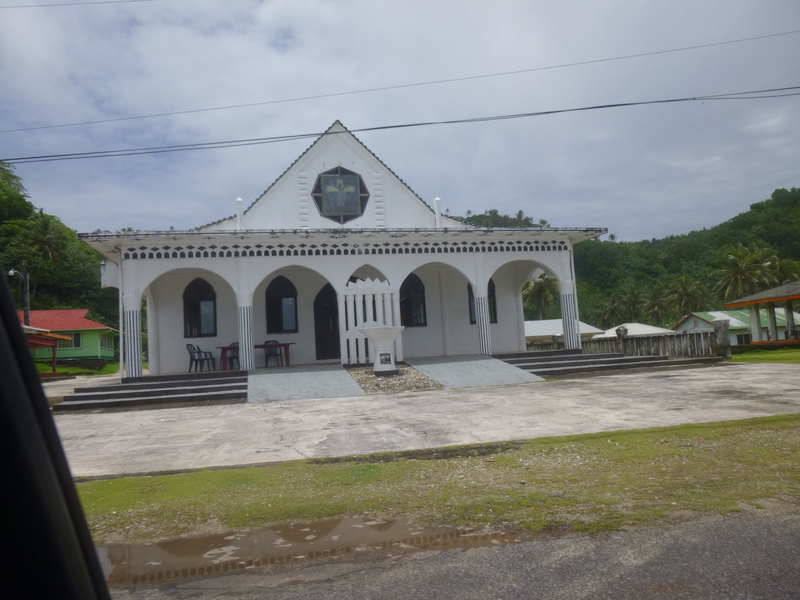 I drove through numerous little villages that were all very similar – groups of mostly small, colorful square homes with a church or 2 kind of dominating each village. And since it was Sunday morning, everyone was flocking toward church. 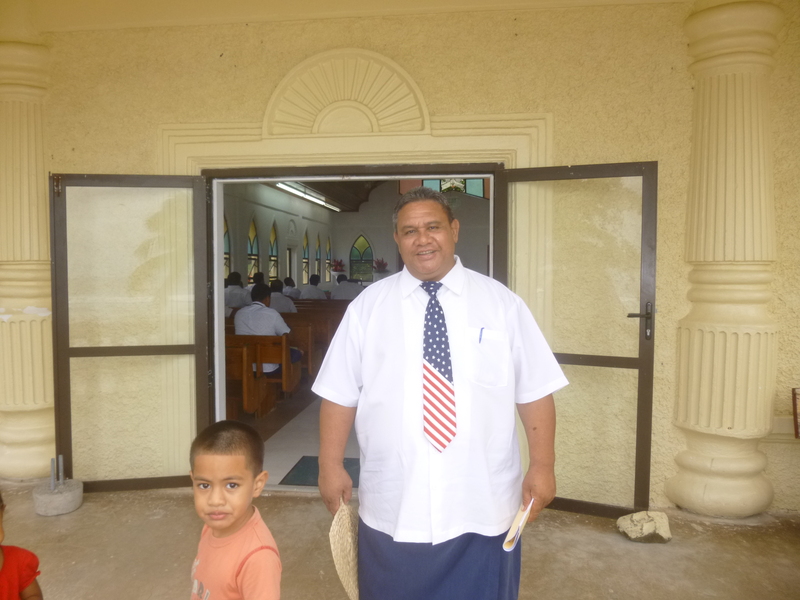 Samoans have large, close-knit families and everyone I saw was going to or coming from church. 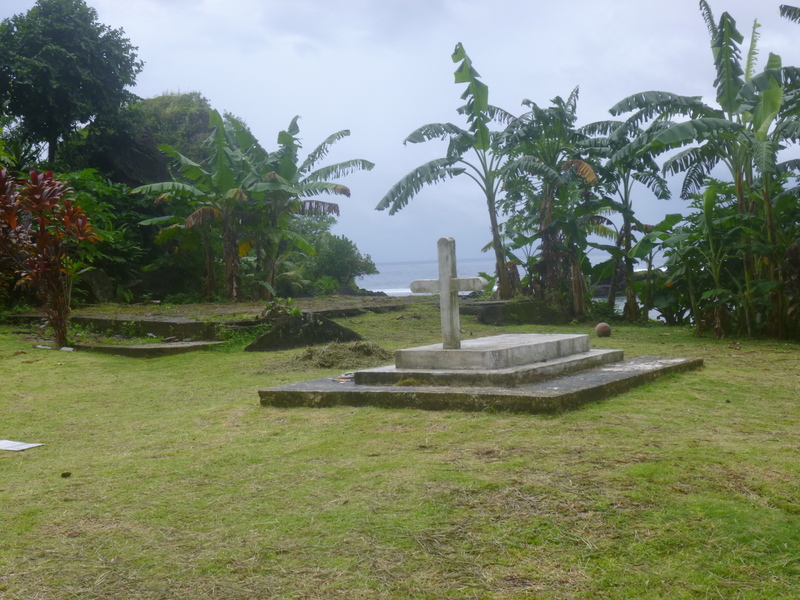 Most people were dressed all in white – the women in the 2-piece tunic and long skirt outfits (I never quite understood the Samoan word for them) and the men in white shirts and ties, and many wore the lava-lava “skirts” and some had a sports coat on too. 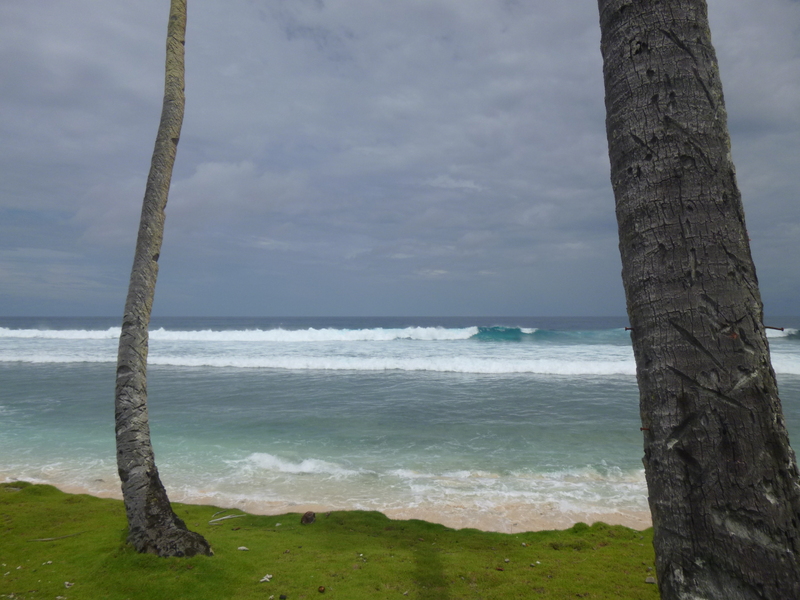 Many carried umbrellas, which I think they frequently do anyway – the island seems to be prone to frequent short showers and I got wet on my first walk! But everyone just looked so fresh and white – it was all very attractive, even though they had to dodge mud puddles in all that white! 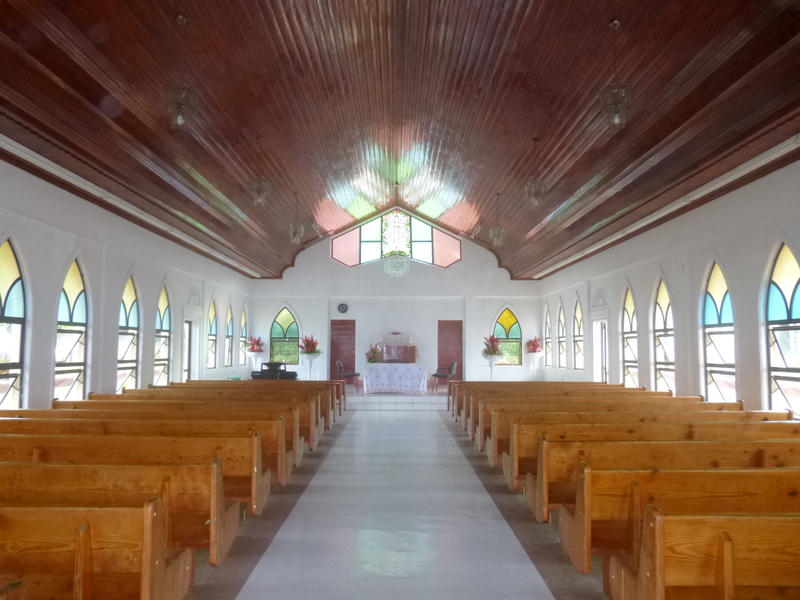 The churches are all similar – rectangular buildings with an ornate front, and the windows are made of horizontal glass slats and all windows were open, so I was able to enjoy beautiful singing as I was walking by. The Samoans like to sing! And i also heard part of a sermon in Samoan. It made me feel a little guilty to be out walking when so many people were in church! But it also made me want to make a donation to a church, but I wasn’t quite sure how to accomplish that because I certainly wasn’t going to interrupt anything, and I figured it was family time afterwards, but the day was young. I didn’t make a donation yesterday – I’m having to look at other options than what I often do because there are no food pantries, soup kitchens or homeless shelters on the island – the people take care of their own, and I heard this several times. If someone is hungry, someone else will make sure they get something to eat. 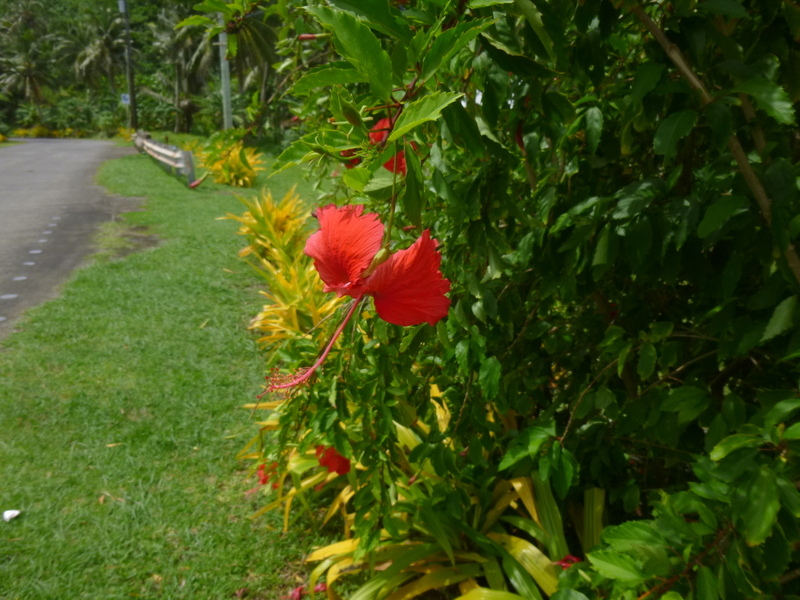 And there is a lot of natural food around with all the bananas and coconuts and taro root. I heard the only people who might be out wandering around are a few with mental challenges, but even they’re looked after. And while there might occasionally be someone who sleeps on a bench at a bus stop, it isn’t a typical thing. The island is small; the families are close; and they seem to take care if each other – and that is wonderfully refreshing. 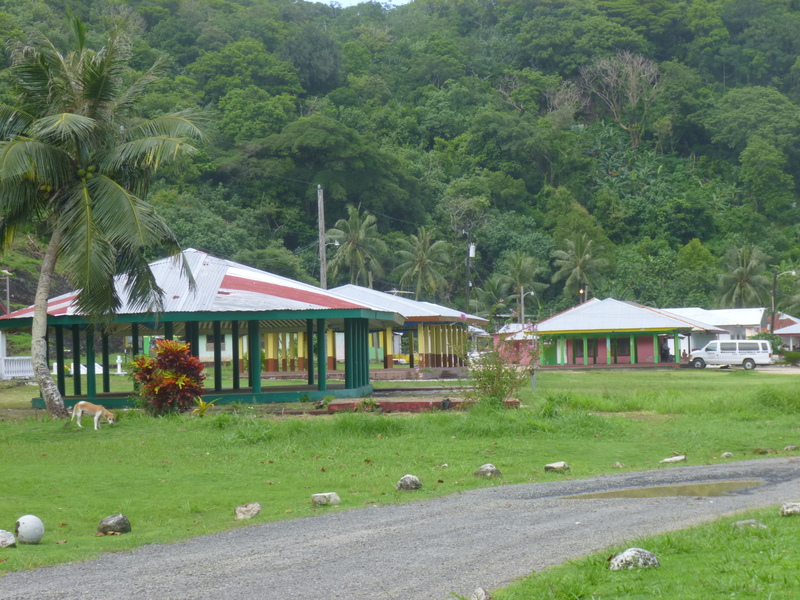 But, it isn’t all idyllic – I heard a surprising number of sirens, and there is a correctional facility on the island, and there’s also a big Catholic social service organization on the more-crowded west side of the island to help people with alcohol and drug issues and domestic violence and that sort of thing, so there are social services available when necessary. But all-in-all, I’m approaching my donations from a different angle, and will look toward churches and schools and see what else I run across. 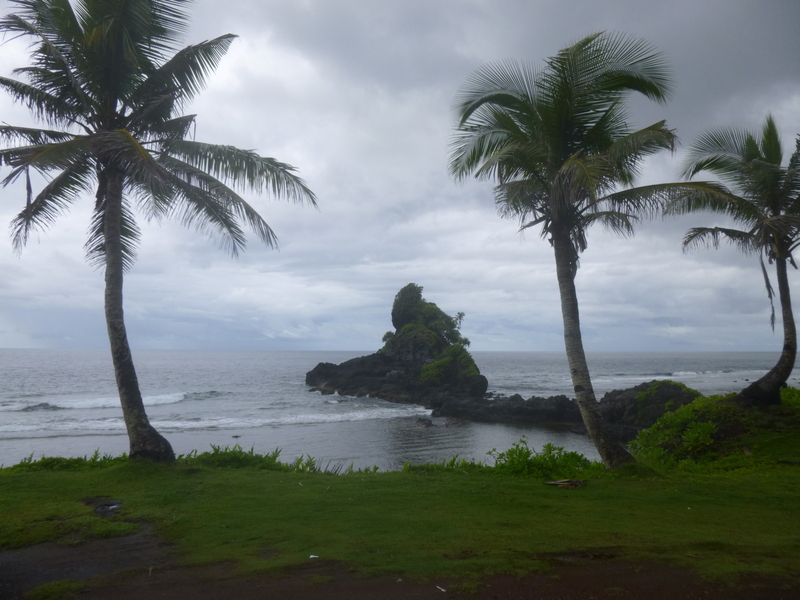 I continued my drive along the one road on the east side of the island – through villages with names like Atu’u, Aua, Aumi, Avaio, Afulei, Pagai, Fofa’au – they begin to all look alike! The villages are small and often less than a mile apart. In addition to the homes and churches, most villages had a small general store, a bus stop, and my favorite – numerous outdoor community gathering places that looked like large rectangular gazebos with open sides. Groups of people could gather in them – the roofs would keep them out of the glare of the sun, but the sides were open to the ocean breezes. Many of these buildings were right near the churches and I’m guessing they could also be decorated for weddings and other special events. I liked the whole idea of these places. Some were big enough that kids could play some sort of ball game in them. As morning wore into afternoon, I could see more and more people spending time outside – this is not a place where people keep there noses glued to the TV or a computer! 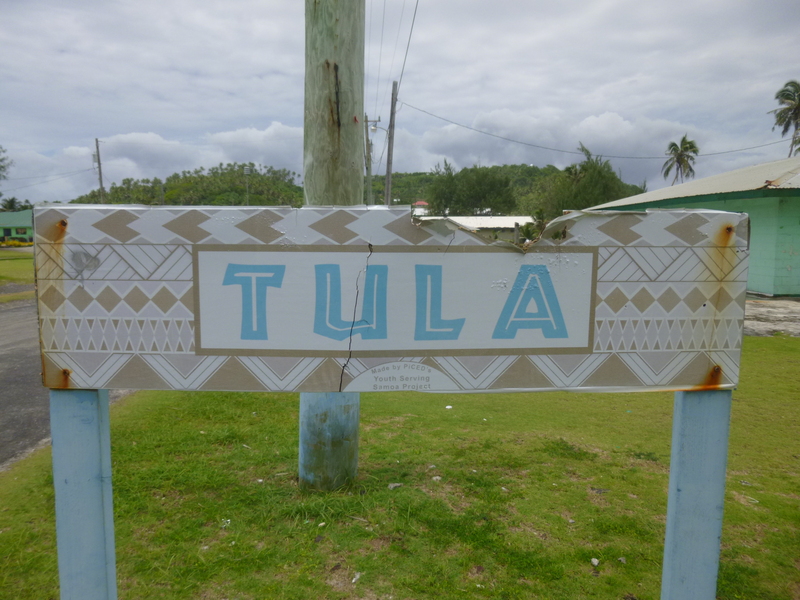 And then I came to my favorite village on the farthest east side of the island – Tula! Who knew my dog would have the same name as a small Samoan village! It was a pretty village – a bit larger than some of the others. There was a nice elementary school, and a narrow sidewalk out of town along the sea. I loved it. I knew I’d be making a donation to the elementary school in honor of my dog! I’d been stopping to walk 2 1/2 – 3 miles at a time along the drive east, which is about all I’m comfortable with in this heat. And then it was always nice to get back in the car with the a/c, but I was out during the heat of the day too. My walking was just along the road which paralleled the coastline – it seemed almost like a wide walking path instead of a road, and not very many cars were out and about. 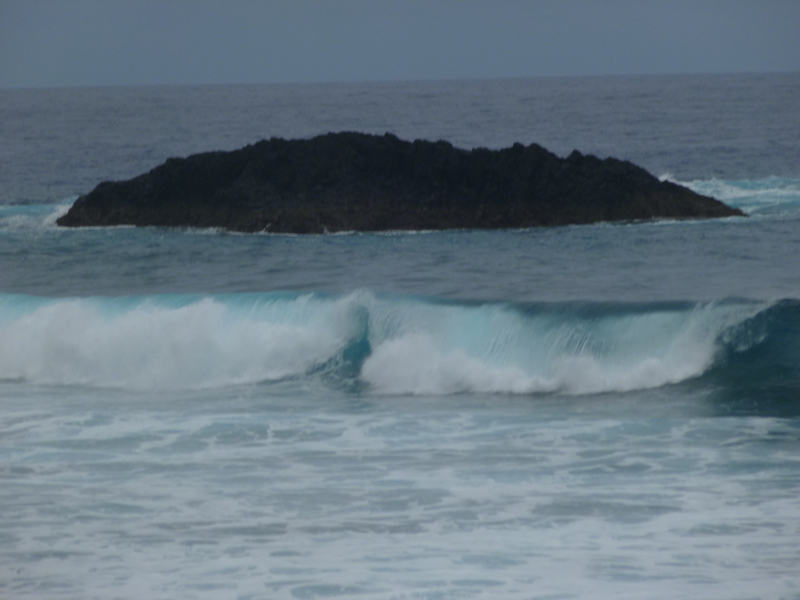 The coastline near Tula was especially pretty, with magnificent huge waves. But…that was because a major storm was heading this way, and they were predicting gale warnings would go out tomorrow. 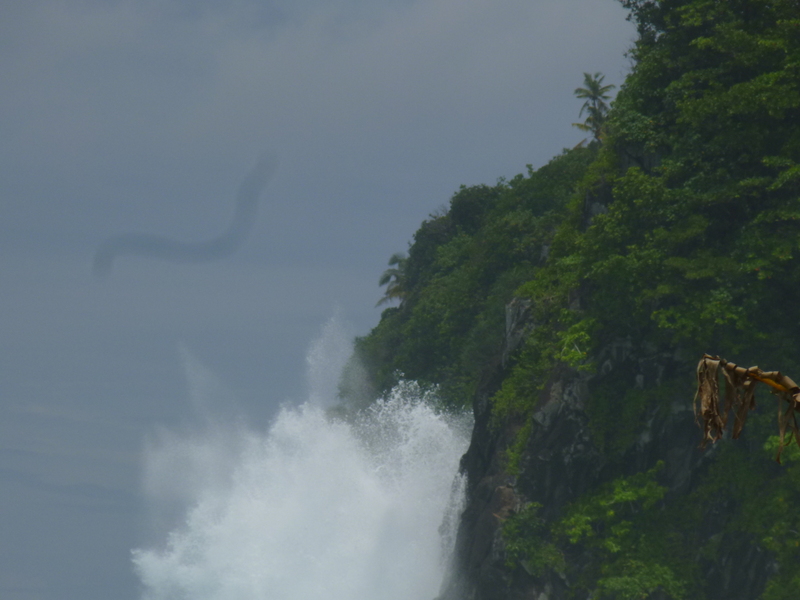 It was quite windy, which helped with the heat, and the waves were a front runner of the storm. They were very spectacular. 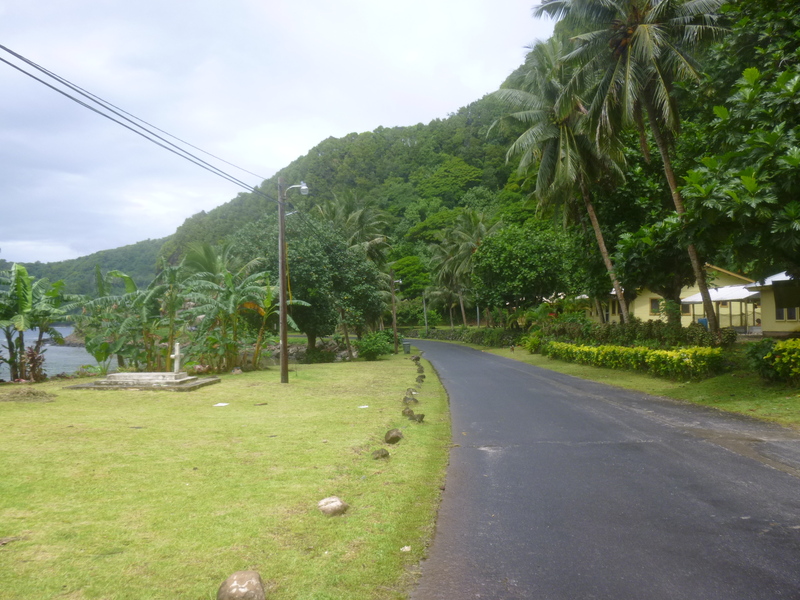 It was getting to be late afternoon now, and there were only 4 more villages to drive through as I rounded the northeast side of the island to the literal end if the road. And I wanted to drive to the end. Then I started making my way back, and decided to take the pass through the mountains to one of the north side villages. It was a steep climb up and down, but had great views of the bays and ocean. 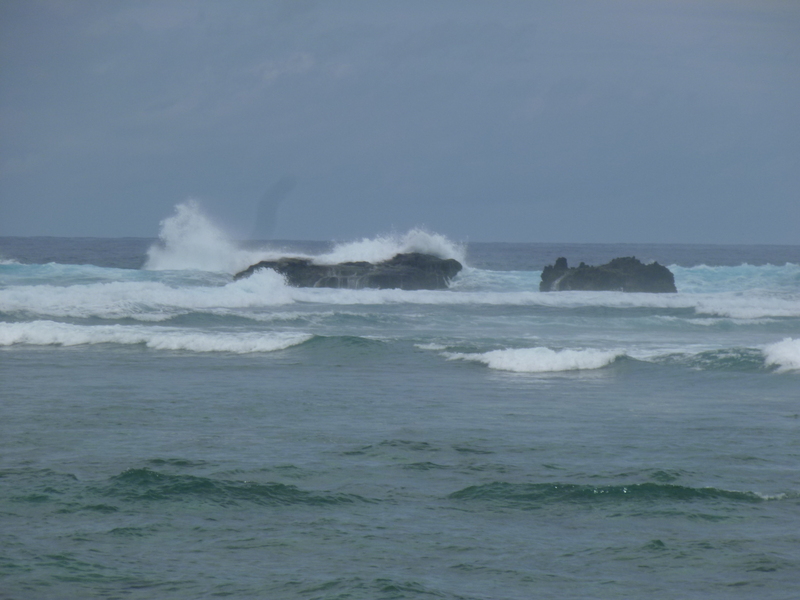 I came to the village of Sa’ilele, and again was struck by the power of the waves on this shire also – smashing onto some of the rocky little “islands” just offshore. The road ended in Sa’ilele and I parked the car for one last short walk by the water. There was a pretty church right across where I parked, and the doors were wide open, so I thought I’d go inside and take a look. Some kids who were near the water came up to me and asked to see the pictures I had just taken with my camera. And then they asked if I had any money! I went into the church and then a couple of adults showed up, and I thought I might have committed some faux-pas by going insie the church. But they were there for an evening event that would start in a while. They wondered where I was from, and I told them a little about what I was doing. It seemed like a good idea to mention a possible donation, and the guy said I should talk to the pastor who lived right next to the church (as do most of the pastors). We went to the front porch and the pastor came out and I started explaining what I was doing. He stopped me and went to get some chairs so we could sit at the table on the porch – I thought he felt bad for me, maybe looking hot and tired since I’d been out all day! I told him I was fine and he didn’t have to bother moving chairs, but he said it was a sign of disrespect to stand during a conversation like this. And his little son brought me some ice cold water. In the end, it was a very interesting conversation and they were very pleased to be included in my journey, although it would have to be approved by some of the other church people – the pastor doesn’t makes decisions all on his own – he likes to include other people which is really nice. I wrote out a short note that he could share, and gave them my check. He was proud of his village, and told me the governor and lieutenant-governor both came from this village, although their terms had just ended. I could see people beginning to arrive at the church for an evening event, and I didn’t want to hold him up any longer. Even though he needed to go, he still offered me some kind of cooked banana dish if I wanted it, but I declined because I didn’t want to keep him from church. As we walked back toward the church, the people inside had already started singing, and it was a really pretty way to end the day, along with a quiet drive back to the motel. Very interesting blog! 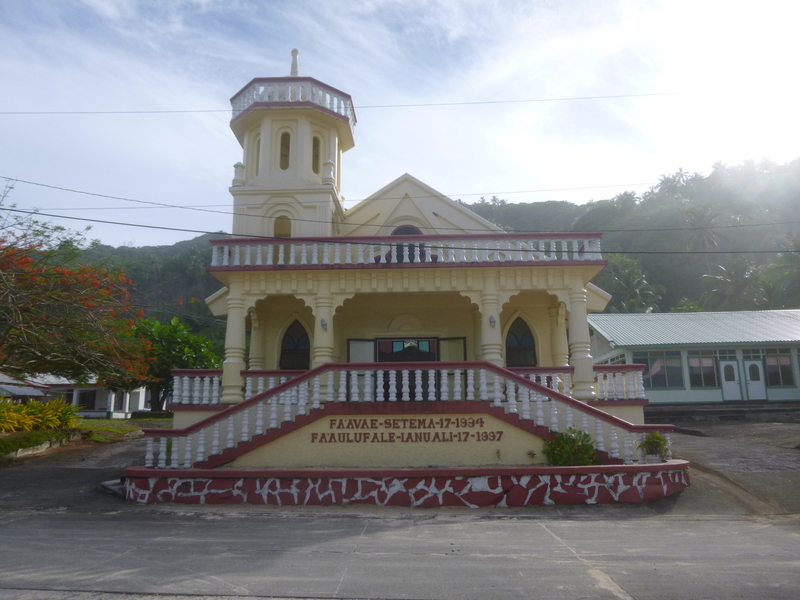 Found quite by accident and having lived in Pago Pago years ago was quite intrigued. The two piece women’s attire is called a “puletasi”.